Laurie Wilson was the son of Danny Wilson, the former manager of Barnsley, Bristol City, Sheffield Wednesday and MK Dons. Wilson junior played under him at Wednesday but failed to make the breakthrough into the first team and eventually left to join Burton Albion at the end of the 2003-04 season. He was never really accepted there and went out on loan to Grantham Town and then Belper Town. He was released from Burton at the end of his one season there and joined the Harriers in July 2005 after Stuart Watkiss proclaimed him as ‘one for the future’. 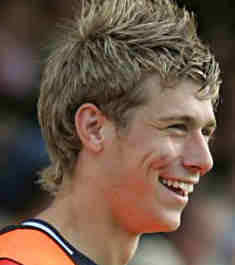 Laurie Wilson eventually left Aggborough in March 2006 after being yet another player that failed to excite us.